The UK water companies undertook an extensive range of activities to ensure water resources in the long, hot summer of 2018 were successfully managed, according to a new analysis by Water UK. Summer 2018 was the hottest in England since records began back in 1910. Rainfall across the whole of the country over the 3 months of May to July was only 54% of the long-term average, with even less falling in August – only 43% of the normal amount of rain for the month. The dry summer put substantial pressures put on water supplies – however, the water companies successfully maintained supplies despite a substantial and prolonged in rise in demand for water, and without the need in England for hosepipe bans. Summer also typically sees more bursts on network when the ground dries out and moves, causing pipes and joints to crack. The briefing paper sets out the range of actions taken ahead of and during the summer to ensure customers got the water they needed and outlines the actions currently being taken over the autumn and winter to prepare for 2019. At the peak of the heatwave, Southern Water put an extra 100 million litres of water a day above the normal into supply, while Severn Trent Water and Yorkshire Water put an extra 300 million litres in respectively. Thames Water put in an additional 450 million litres of water a day. “Much of the potential impact of the hot summer was avoided due to ongoing high levels of investment by the water industry” – currently running at around £8 billion per year. Thames Water started up Beckton desalination plant – the plant is now undergoing maintenance to ensure it will be able to reliably sustain prolonged usage in event of prolonged drought next year. Increased activity to identify and fix leaks included using drones, satellite imaging, improved telemetry and acoustic logging leak detection technologies, and the deployment of extra repair teams on the ground. Looking further ahead, they have also been working with the Environment Agency to consider the impacts of the reasonable worst-case scenario and stress-testing against more extreme rainfall scenarios. The analysis says the water companies are continuing to assess critical asset maintenance to ensure facilities are available when needed – which could include deferring planned maintenance at key periods or developing new sources. Tarmac is down, road lines are being painted and Newtown’s bypass is starting to look the real deal, according to one of the town’s councillors. Work is now into the final stages for the bypass, which has cost more than £80 million and will see congestion issues that have blighted the Newtown area for decades banished. Work began in March 2016, and now pictures captured by county councillor Joy Jones show tarmac down on almost every section of the route, and line markings and signs in place. She was given a tour of the route last week and said excitement is now growing ahead of a big opening next year. She said: “It is getting there and is getting closer and closer. “People are going to be able to get around the town so much easier, but on the flip side they will be able to come into the town quicker because of reduced congestion,” Councillor Jones said. “Work is still going on, not just on the final parts of the roads, but on all the trees and wildlife around the edges. There is still some work to do on the Dolfor Road bridge, which is the biggest structure on the route. Last month transport minister Ken Skates said contractors Alun Griffiths are on track to be finish on time. Councillor Jones said that was providing that the weather remains good for the workers in the final few months. She said: “Hopefully the weather remains good to the contractors now. “It is a real piece of history and we are seeing the final pieces now being put together. Hertfordshire’s roads are being prepared for the worst of the winter with a programme of patching and resurfacing. After harsh weather last year, when routes were badly affected by repeated freezing, the county council’s highways team have fixed almost 24,000 potholes so far this year. • Given 1,000 sections of road a new surface. More maintenance and repair work was being carried out during November and December. Cllr Phil Bibby, Herts County Council’s cabinet member for highways, said: “We know that the state of the county’s roads really matters to our residents, and this work will improve road surfaces and help stop potholes forming if we get freezing weather again this winter. “Our engineers and contractors have done a great job fixing potholes since last winter, but the priority for us is to prevent them forming in the first place. 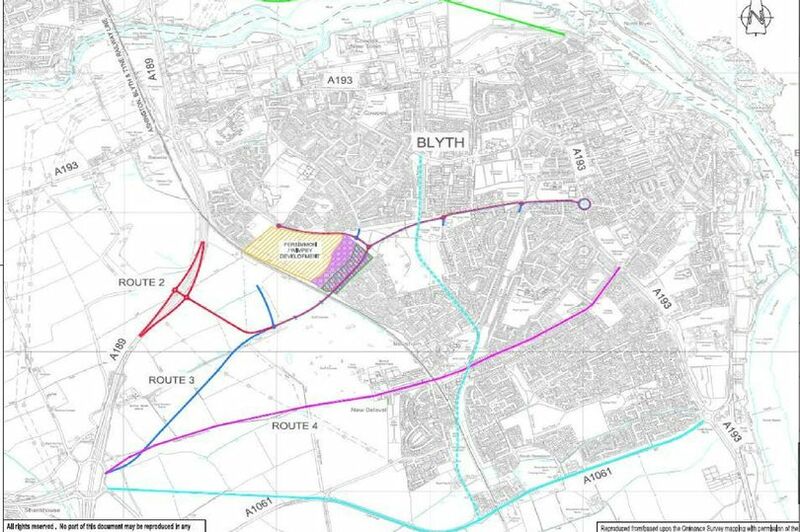 Northumberland County Council is pushing ahead with plans for a multi-million pound relief road to ease traffic congestion in Blyth. The proposals are set to go out for consultation early next year and with potential funding opportunities already identified, construction could begin as early as 2020. A report to councillors explained that “a strong positive business case for the scheme” has been demonstrated and that funding could be available, primarily through the Transport for the North. From an initial assessment of five route options, there are three which have been subject to a detailed economic appraisal to weigh up the benefits and risks. 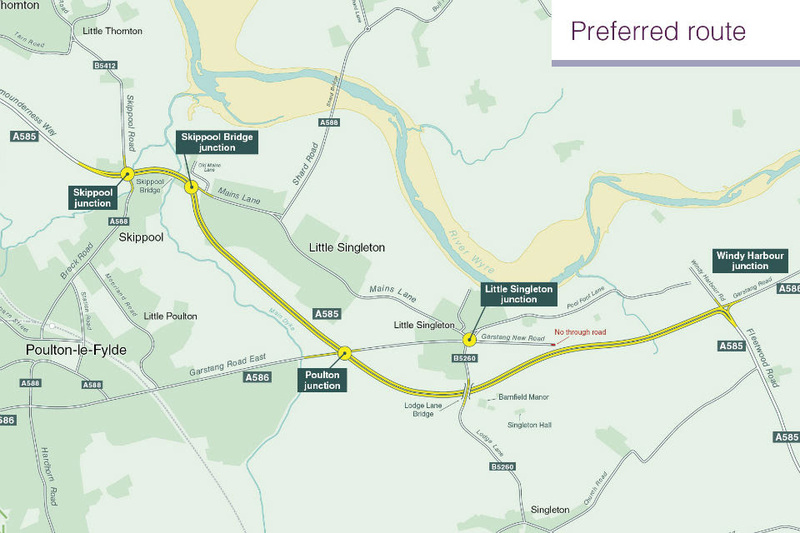 These are a new link road from Princess Louise Road to the A192/A189 Three Horseshoes interchange (route 3), a link road from Plessey Road to the Three Horseshoes interchange (route 4) or dualling the existing A1061 Laverock Hall route (route 5). A new internal north-south route, which could potentially reduce congestion on the A193 Rotary Way, was also put forward to be included in the study. The study concluded that while route 3 provided the greatest benefit, it also has high levels of risk to deliver it, while route 5 has the lowest risk but also the lowest benefit-to-cost ratio, while still being classed as high value for money. The indicative costs range from £19.7m for route 3 to £24m for route 5. 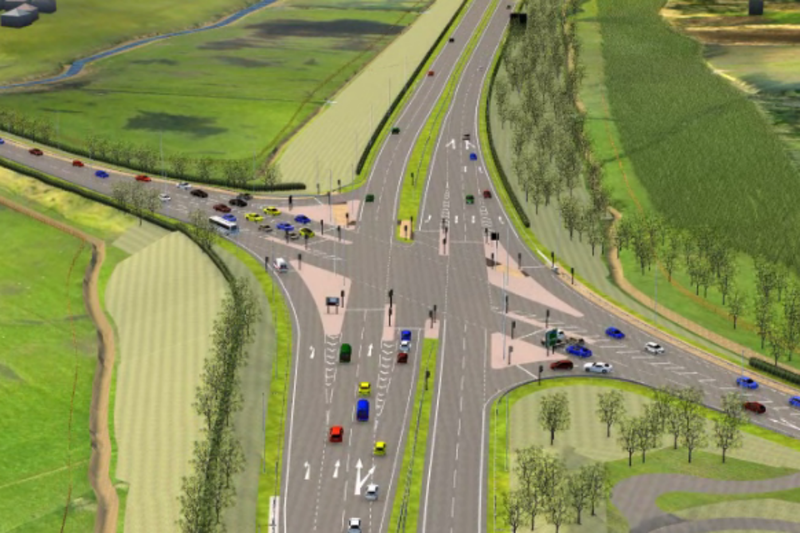 The £24.1m north-south route provides an opportunity to create an arterial route in addition to the existing A193 Rotary Way and would support both routes 3 and 5. As part of the proposals, the potential for the council to take control of the land of the former railway running from Newsham to Albion Way/Dene View Drive is being considered. The disused line has long been the subject of fly-tipping and anti-social behaviour, but could be included in some form in the plans. Coun Richard Wearmouth, the council’s cabinet member for economic development, said: “Blyth was a forgotten town under the previous Labour council, a poor relation to Ashington and we will not allow that to continue. As part of the draft Northumberland Economic Strategy 2019-24, which was approved by the cabinet at its meeting on Tuesday, members agreed to release £95,000 from the council’s reserves for the next steps. This would cover the costs of consultation in January and February, finalising the scheme appraisal and then assessing the environmental impacts in the build-up to deciding a preferred route. Currently, the A193 Cowpen Road and A1061 Laverock Hall Road are each used by 20,000 vehicles a day and ‘suffer from congestion during peak periods’. A fledgling Cumbrian company whose innovative technology with the potential to be up to 90% more energy efficient which could help slash the cost of water treatment worldwide has won its first major contract with United Utilities. Penrith-based Typhon Treatment Systems’ new ultraviolet (UV) LED water treatment technology is one of the first systems in the world capable of using UV from LEDs to neutralise harmful microorganisms on an industrial scale. Other LED UV treatment systems are currently only effective at treating small amounts of water for very low flows or personal use. North West water firm United Utilities uses UV in its drinking water treatment process to remove microorganisms or to remove earthy smells caused by algae. It also uses UV treatment in separate installations to treat bacteria in wastewater before returning it to the environment. The two companies have been working together on the technology since its potential came to light as part of a worldwide tech talent trawl United Utilities launched in 2017. Typhon was among seven finalists in United Utilities’ Innovation Lab – giving them access to the water giant’s huge wealth of data, systems and expert knowledge to incubate their ideas and help bring their idea to market. Typhon is now hoping to market the product worldwide as a unique, cost-effective, low maintenance UV water treatment, which could eventually render traditional lamps, based on mercury, obsolete. The most serious potholes in Southend are set to finally be repaired thanks to a Government cash boost. Extra cash was set aside by the Government to be sent to local authorities to be used to clear any delayed road maintenance work. Southend Council was awarded £617,000, which it will use to fill the borough’s most serious potholes, give the High Street a mini-makeover, and resurface Western Esplanade and Leather Lane. Andrew Moring, cabinet member for infrastructure, said: “I’m really pleased the Government recognised the need for this financial boost to clear the backlog of identified highway maintenance issues. The repairs will take place across the whole of the borough and come after a programme of work between March and June this year to catch up on a backlog of repairs delayed by the snow and cold weather last winter. Earlier this year, the council allocated an additional £100,000 to fund two rapid pothole repair teams. That cash was in addition to the authority’s agreed £102,000 budget for road repairs, and £195,000 for pothole repairs over the next three years. As part of the plans, High Street will also benefit from a mini-makeover between January and March 2019. The pavements between Southend Victoria and Pier Head have already been assessed, with problems identified, such as damaged or missing slabs, signs and posts. Some of the slabs will be replaced. James Courtenay, Southend Council’s cabinet member for growth, said: “It is great news, especially following on from the concentrated effort taking place between us and our partners to improve and regenerate our High Street. “As well as the health and safety implications of having missing or damaged pavement slabs, signs and posts, there is the aesthetic look and feel of the High Street. “If an area is well looked after and taken care of, it encourages those who use it to also take care of it. Alison Dewey, Southend Business Improvement District (BID) Manager, added: “It is great news to hear that the council is investing this money to improve the town centre’s street scene. “I am particularly pleased to hear that there’s going to be a full repair of the paving and that it will be sealed, as this will help to prevent any staining from spillages that can seep into the flagging and leave a permanent mark. In total, £400,000 will be spent on repairing potholes, £117,000 will be spent on repairing the paving slabs, signs and posts in High Street and £100,000 will be spent on resurfacing Western Esplanade and Leather Lane. The Anaerobic Digestion & Bioresources Association (ADBA), the UK’s leading trade body for anaerobic digestion (AD), has announced that it is recruiting a new Chair to lead the association into its second decade. Charlotte Morton, Chief Executive of ADBA, announced at the ADBA National Conference 2018 this morning that on its tenth anniversary, ADBA will create a new role of Chair to lead the association into its second decade, supported by ADBA’s Advisory Board and the executive team. The new appointment is aimed at helping ADBA to drive the growth of an industry that can reduce UK greenhouse gas emissions by close to 5%, improve its energy and food security, and create tens of thousands of jobs throughout the UK, with opportunities to export into a global market estimated to have a £1 trillion market potential. Once the Chair is in place, Ms Morton will continue on ADBA’s Advisory Board and in her associated role of Chief Executive of We Are Orchard, the company that has been providing association management services to ADBA (as well as other green sector trade associations including the World Biogas Association) for the past three years. In this role, Ms Morton will be responsible for the delivery of the new ADBA Chair’s strategy and business plan. The operation and administration of ADBA will otherwise remain unchanged. The UK AD industry has the potential to reduce the UK’s greenhouse gas emissions by as much as 5% (helping to decarbonise heat, transport, and agriculture), meet 30% of domestic energy demand, and help restore soils through the spreading to land of natural fertiliser from the AD process. There are hopes that a possible commitment to universal food waste collections in the forthcoming Resources & Waste Strategy and increased support for on-farm AD on the back of the government’s changes to farming support will allow more organic wastes to be sent for recycling through AD over the coming years. Founded in 2009, ADBA currently has over 400 members including AD operators, equipment suppliers, finance specialists, farmers, academics, waste management companies and gas distribution networks. A congestion-busting new dual carriageway between Windy Harbour and Skippool near Poulton-le-Fylde in Lancashire is a step closer after the Planning Inspectorate agreed to examine Highways England’s plans. The £100 million proposal – to bypass the existing A585 – is being proposed as part of the Government’s £15 billion Road Investment Strategy (RIS). The Planning Inspectorate will now scrutinise the idea and invite formal public responses before letting the Secretary of State decide if the new road can be built. “We are delighted the Planning Inspectorate has accepted what is effectively a planning application for the bypass we adopted as our preferred option last year and have since refined in response to further public feedback in a statutory consultation in the spring. The Planning Inspectorate’s involvement marks the penultimate formal milestone in the life of the project before construction can start before the end of March 2020 – subject to the green light from the Secretary of State. Since being unveiled as the preferred route in October of last year the southern bypass proposal has been refined in response to public feedback – with a signalised junction replacing a roundabout at the western, Poulton end of the new bypass and a proposed Grange Road junction removed. The initiative is a feature of Thames Water’s recently published £11.7 billion business plan for 2020-25, with £1.1 billion assigned to activities that will protect and enhance the environment. “The climate is changing and, with our population expected to rise, flooding and rainwater during intense storms is an issue we need to tackle now to protect our communities in the future. “We’ve launched a fund to deliver schemes with the potential to drastically reduce the impact surface water has on our sewers. The work builds on existing initiatives from the Thames’ “Twenty 4 Twenty” scheme, which is on track to remove 20 hectares of impermeable surfaces. One such scheme is at Queen Caroline’s Estate, London, where several sustainable drainage schemes were delivered through the Climate Proofing Housing Estates programme, diverting 1.2m litres of rainwater every year. Alongside community initiatives, Thames Water also plans to implement sustainable drainage measures for households, developing an innovative planter which collects rainfall from the drain pipe before slowly releasing it back into the sewers. The planter, which helps free up capacity in the network during high rainfall, is designed to be used in residential gardens, with excess water also captured for future uses such as watering the garden. Thames Water’s newly launched SWM programme will fund work with stakeholders and local authorities with priority given to major schemes in areas most at risk of flooding. However, local authorities across the Thames Water network will have the opportunity to partner with the company. Roads in North Somerset and Bath & North East Somerset are set to benefit from an additional £3.4million investment in 2019 to tackle potholes. The allocation of the additional funding from the Department for Transport was announced in the controversial autumn budget. The Chancellor of the Exchequer Phillip Hammond announced he was allocating £420m to tackle the pothole epidemic in the country £20 million more than was being allocated to schools to buy “the little extras they need”. The allocation of such a substantial sum to road maintenance, surpassing the extra investments in counter-terrorism policing (£160 million), schools (£400 million) and mental health support for military veterans (£10million) has led to critics dubbing the Chancellor Pothole Phil. Following the announcement that an extra £420million would be added to the existing national pothole fund of almost £300million it was revealed that the South West would be receiving £71.9 million of the investment into repairs. £1,671,000 of that sum has been allocated to Bath & North East Somerset, whilst North Somerset is set to receive £1,779,000 and Somerset Authority which includes the Mendip district is to receive one of the biggest amounts of £9,980,000 to spend across its five non-unitary districts. The announcement was welcomed by the local councils who have been facing funding shortages for many of their services. North Somerset Council’s deputy leader Cllr Elfan Ap Rees, whose portfolio includes highways and transport says the £1.8m allocation is more than double the amount the council received last year. The results from a roads condition survey released by the Department for Transport earlier this year found that North Somerset had some of the best-condition roads in the UK. The council has adopted a ‘whole-life’ proactive approach to roads to make sure that, wherever possible, preventative work is carried out to extend the life of road surfaces before more costly repairs are needed. The council also carries out high quality, urgent repairs on potholes across the area, operating on a’‘fix it once, fix it well’ basis. Whilst Cllr AP Rees has welcomed the increase in funding, according to reports in the Weston Mercury and North Somerset Times he has also conceded that the council ‘could do with more’ to tackle the problem. A statement echoed nationally by pothole experts. Whilst the RAC claimed that the number of drivers breaking down after hitting potholes had reached a three-year high. In May 2014 the Gazette reported on the number of potholes peppering the roads in B&NES. With it being revealed that the council had to repair more than 2,000 potholes in the space of four months, from November 2013- February 2014. Whilst last year a Freedom of Information request by the Bath Chronicle revealed that in the past five years there had been 551 pothole-related compensation claims made to the council due to the poor road surfaces in the region. 225 of these claims were successful in receiving compensation. Now with this additional funding it is hoped the number of claims will reduce.